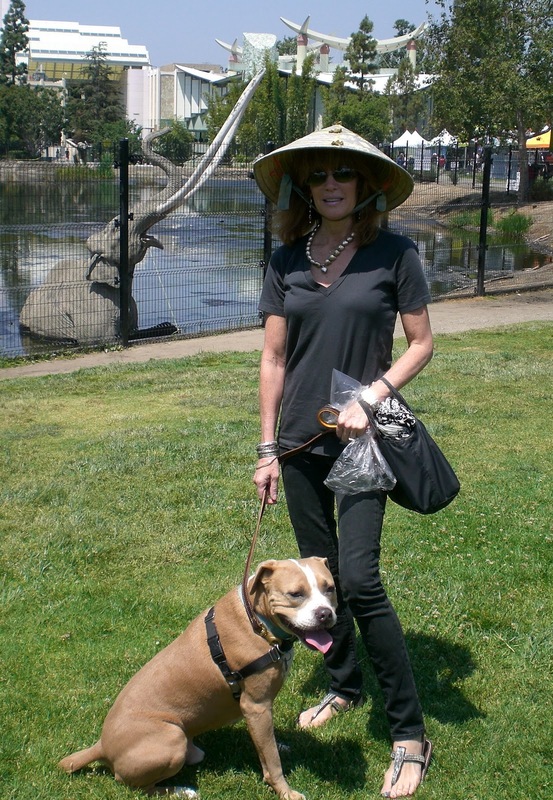 Eugenie, Tanner and I spent a gorgeous, sunny afternoon at the La Brea Tar Pits where Best Friends is sponsoring their annual mega-adoption weekend, with 50+ rescue groups and 1,000 dogs and cats all looking for that special two-legged someone to give them a loving home. 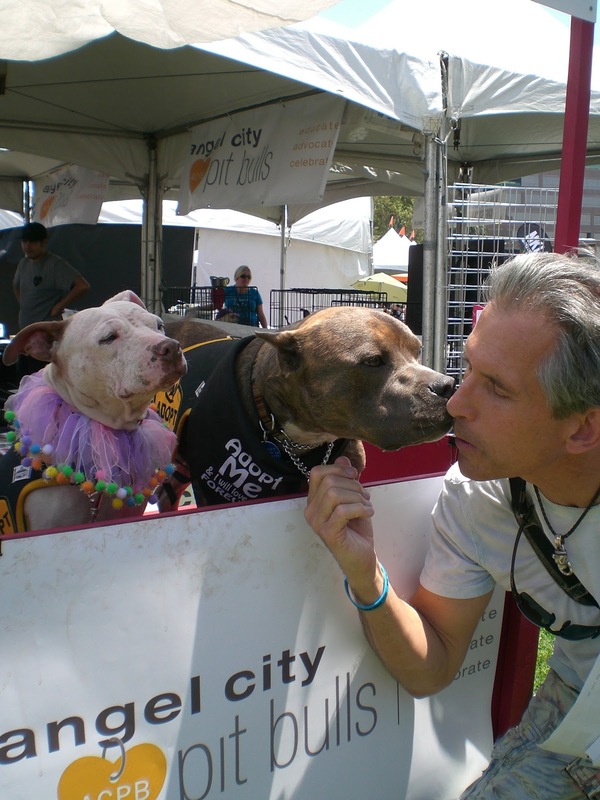 Of course, there were tons of handsome cuddly Pit Bulls, including two at a ‘Kissing Booth’. Tanner was bashful, so I stepped in and puckered up for a good cause. We met all sorts of dedicated rescue folks, including: Angel City Pit Bulls, No Stray Left Behind, Adopt Me Rescue, One Dog Rescue, Operation Blankets of Love (one of my longtime ‘give to’s), Good Dog-Dog Talk Rescue, Westside German Shepherd Rescue, Rescue Works, Pug Nation Rescue of Los Angeles, Almost Home Animal Rescue, All Animals Big and Small, Sparky & the Gang Animal Rescue, New Leash on Life, Heart Bandits, The Red Nose Lucy Foundation, and Boston Buddies. If you or anyone you know is thinking of getting a rescue dog, head on down there tomorrow and I’m sure you’ll find your forever buddy waiting. If not, spread the word and help make L.A. a ‘no kill’ city. 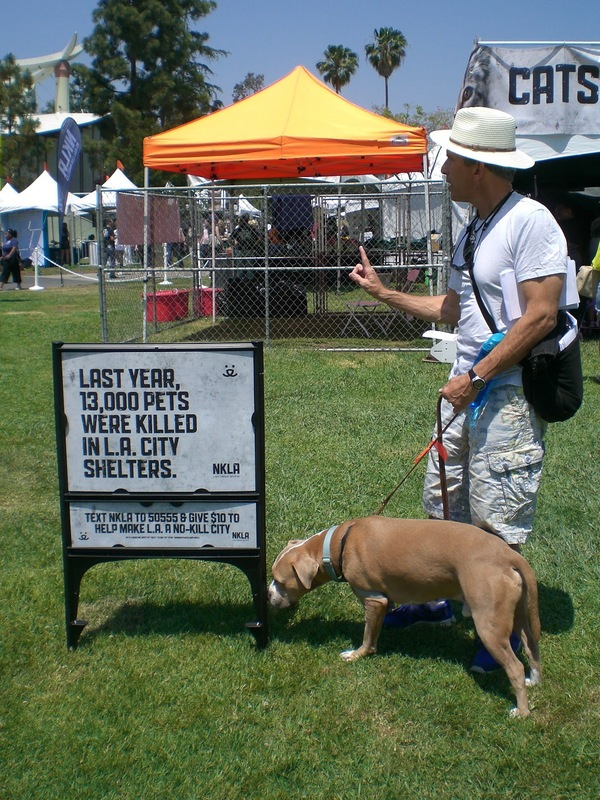 The sad truth: in 2012 13,000 pets were killed in L.A.